The year hasn’t got off to a good start for the local amateur football scene with one club announcing it is to pull out of league and cup competition. Falkland side Lomond Vics, who had been playing in the FAFA Championship this season, announced on its website this week that various factors were behind its decision to withdraw the club from the Kingdom of Fife Amateur Football Association. On a more positive note, the club, part of the community for some years, only intends to play no further part in this campaign, and has not folded altogether. It’s intended that the club now regroups and returns to the amateur ranks next season. A club spokesman said: “Sad news for everyone connected with the club this week as we have had to withdraw from all league and cup competitions for the remainder of the season. 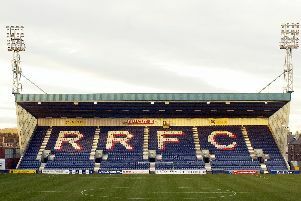 “We’ve been trying for months to bring in a management team, committee and at least six new players but unable to find anyone able to help out. “We have been struggling with sponsors all season too so club funds were very low as well. “As everyone knows it’s hard to get 16 players fully committed to turn up every week for training and a Saturday, especially at this time of year. “We would like to thank everyone that had been involved and helped out the last few years, it’s been a great experience for all of us. The club had been doing everything in its power to keep the side on the park but, sadly, failed to get the backing it needed. In December the Vics made an appeal for new players, a management team and committee members to come forward. All games played against Vics so far this season will now be voided by the league. On the park, Falkland Amateurs started the new year with a loss, going down 5-2 against Kinross Colts at the Loch Leven Campus. It will be league action for the local sides this weekend if the weather allows. In the Premier Division Kingdom Athletic host league leaders Bowhill Rovers at Quarry Park,Leslie. There will be a local derby in Division 1 with Glenrothes Amateurs taking on Balgonie Scotia at Warout Playing Fields. Elsewhere Falkland Amateurs and Markinch Amateurs clash at Muir Road, Freuchie.